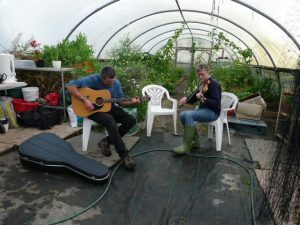 If we are to establish resilience in the way we grow food in these northern climes, living lightly, without the use of heavy machinery and fossil fuels, we need to find a way of producing carbohydrates that makes sense of the land and our available energy (which is getting less as we grow older!). ‘Civilised’ societies have used the plough for thousands of years to break the ground, disrupt the growth of the indigenous vegetation, and provide a medium in which new seed can grow. But, notwithstanding the native American abhorrence of ‘tearing my mother’s breast’, ploughs require enormous amounts of energy to turn the earth. This destroys not only the plants already growing, but also the soil structure, developing ‘plough pans’ that inhibit the redevelopment of soil structure and create barriers to drainage. Furthermore, we don’t have the energy to drive a plough, or the land to sustain a horse or ox to do it for us. Without livestock African farmers, such as Mgeni Lamek, have to till their fields by hand. A team of oxen can plough an area in one and a half hours that would take eight days to till by hand. American ‘farmerettes’ pushing hand-ploughs in 1919. Note the ground is already broken up and they are creating furrows. So we continue our search for a method of growing carbohydrates on a limited amount of land with a limited amount of energy. ensure no stock could ruin our efforts! The first of these just has to be dealt with. It takes time and is tedious but is not energy intensive. The second can be minimised by providing a good overlap. The following three can all be overcome using subsequent layers of other materials. April 2013, our top field. The area to the right along the fence was selected for our second grain-growing attempt. 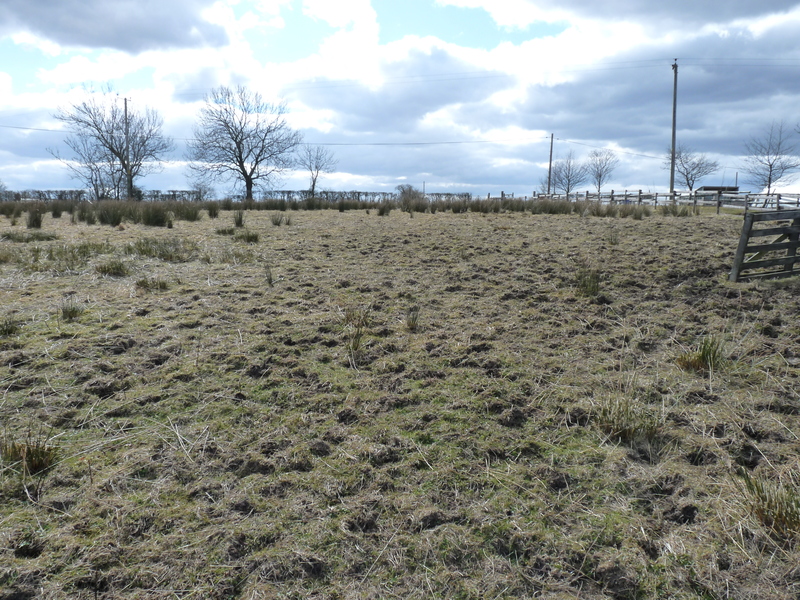 An area of approximately 20 x 5m was chosen along the western boundary of our top field. 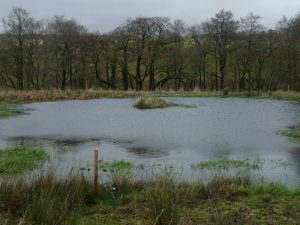 The first job was to prepare it for the cardboard-laying by scything the rushes. Next stage was to lay the cardboard. We used our boxes from the house move that we retainted specifically for this purpose. 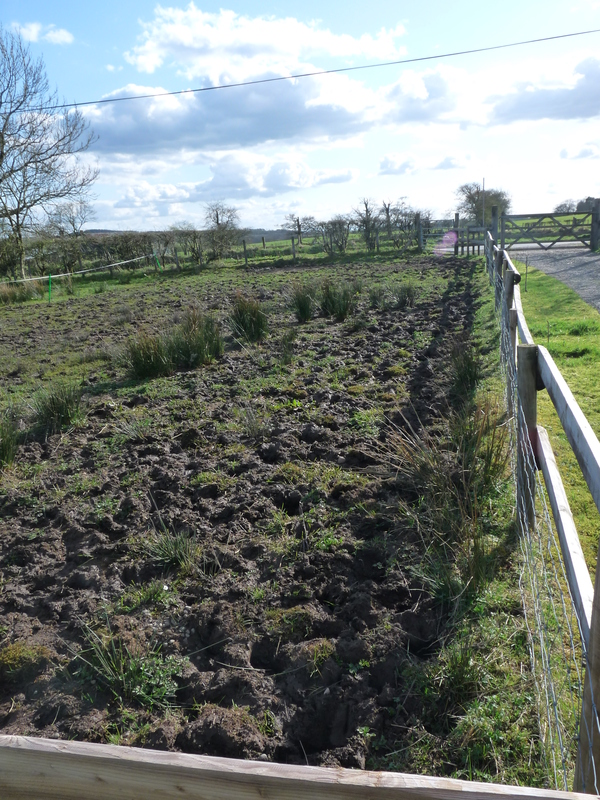 Fixing the cardboard layer was achieved by spreading well-rotted farmyard manure over the whole area. 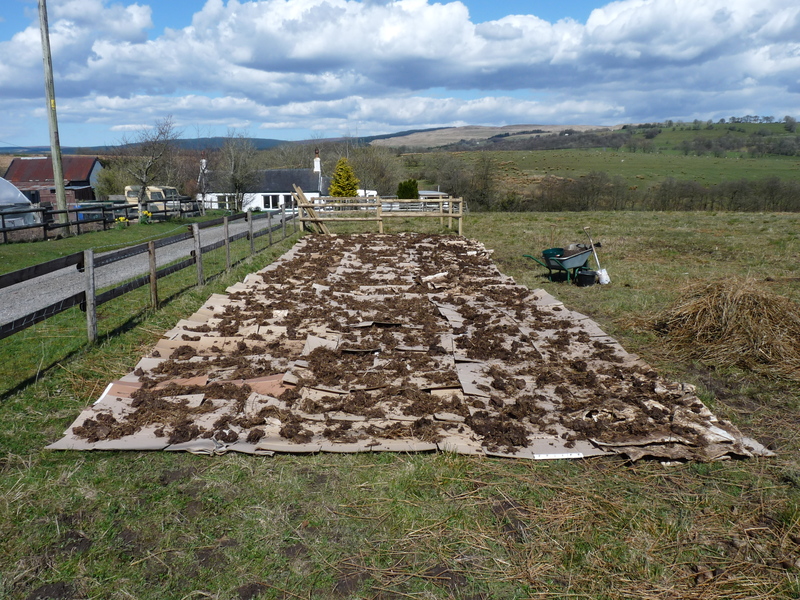 Cardboard layed out and weighted down with farmyard manure donated by one of our parishioners. 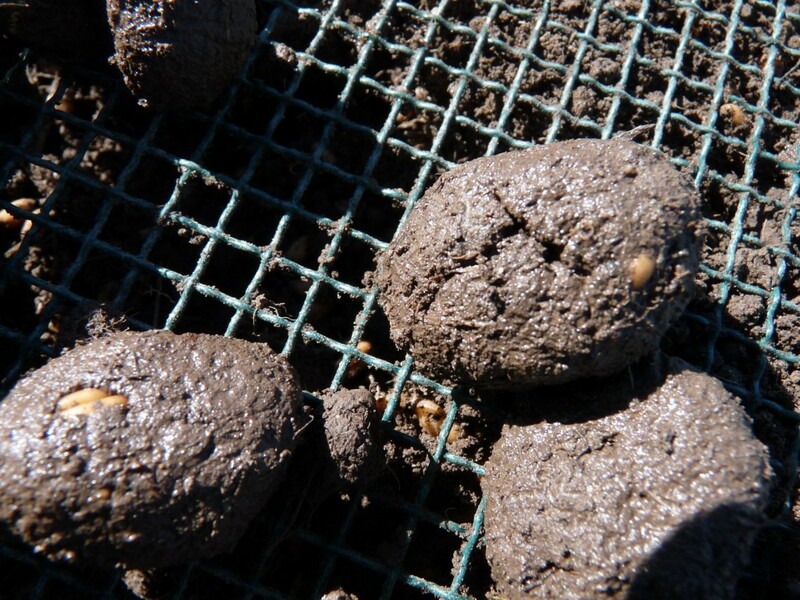 Wanting to work with Fukuoka’s methods of seed-sowing, we again attempted to make seed-balls. Components for making seed-balls: mole-hill soil, riddle, and a bucket of spelt grain. Spelt grain mixed with mole-hill soil and a little water to moisten the mixture. Attempting to sieve the grains into balls in the riddle lead to clumping. 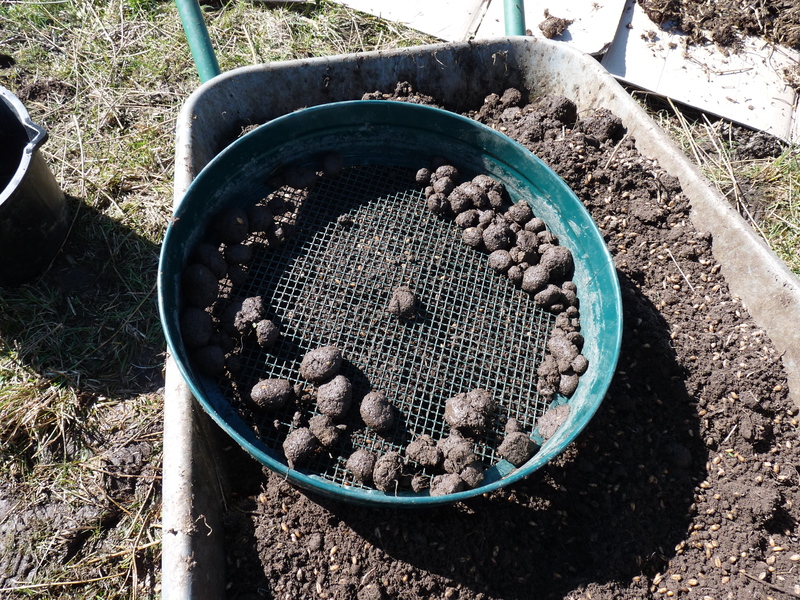 Prolonged sieving lead to larger balls with lots of grains in each clump. This is not what we were looking for. After several attempts with different levels of moisture we gave up the idea as we didn’t have the time or the energy to create individual balls for each grain! So we broadcast the mixture of soil and grain over the carboard/manure base. Cardboard and manure base with broadcast grain/soil mix. The next stage was to provide protection for the grain from birds, the wind (and hence reduce evaporation of moisture from the cardboard), while retaining porosity to the rain, and covering the whole to look better. But what to use? At last we had found a use for our abundant rushes! Scythed and dried, these formed an 8-inch mulch layer over everything. Cut and dried rushes stacked and waiting to be spread. Rush mulch spread over half the grain bed. This half (10 x 5m) contained the spelt grain. The second half of the grain-bed about to be broadcast with naked oats. The completed grain-bed 6 weeks after sowing. June 2013. Well, like all growers, we waited. We didn’t have to wait long before developements started taking place. In fact, within a few days things had started happening. But not the sort of things for which we were hoping. We have, in our area, as probably right across the country, high densities of corvids. These birds post look-outs in trees, on telegraph poles, or just circling around to keep an eye on things while the rest of the flock feeds on the ground. Whether they be jackdaws, rooks, or crows, they are intelligent birds that don’t miss a trick. In fact, as an aside, last year we went through a period where our hens seemed to stop producing eggs in mid-summer. Perplexed, we thought the eggs must be being taken by a rat, but there was no evidence – no broken shells, no rat-droppings. Until one day, when sitting at the desk in the study, which looks out onto the hen house, a hen came out and crowed as hens do after laying an egg. Within a few minutes a large black crow landed on the roof of the hen house. After looking around and checking the territory to make sure there was no danger, it jumped down, hopped into the hen house, and in less than 10 seconds was out again, flying straight off – with an egg in its mouth! Back to the grain. They had spotted the grain being broadcast, bided their time, and when all was clear, ie early in the morning, came down in numbers and started rummaging through the 8-or-so inches of rush mulch to find the grain below. Then the pigeons realised the corvids had found an abundant food supply and joined in. There is an old saying when broadcasting grain – 1/3 for the birds, 1/3 to die, and 1/3 to grow. Well as it turned out the birds took a lot more than their third. As the year progressed it became clear that almost nothing was left. The spelt was old seed and had a low germination rate, but the naked oats were fresh. In addition, the summer was hot and dry, which was extremely unusual – our first dry summer since moving into the area in 2008. It is probable that the ‘third to die’ was the rest of the ‘crop’. We tried this but it didn’t work. Clearly, we are no saints! Nevertheless, the cardboard mulch worked well against the grass. 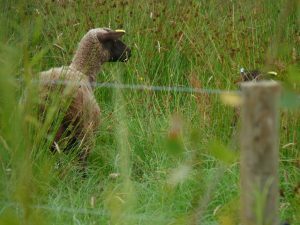 But not against the creeping buttercup, which just sent out runners towards any crack of light, nor against the rushes, which bulldozed their way through the cardboard. 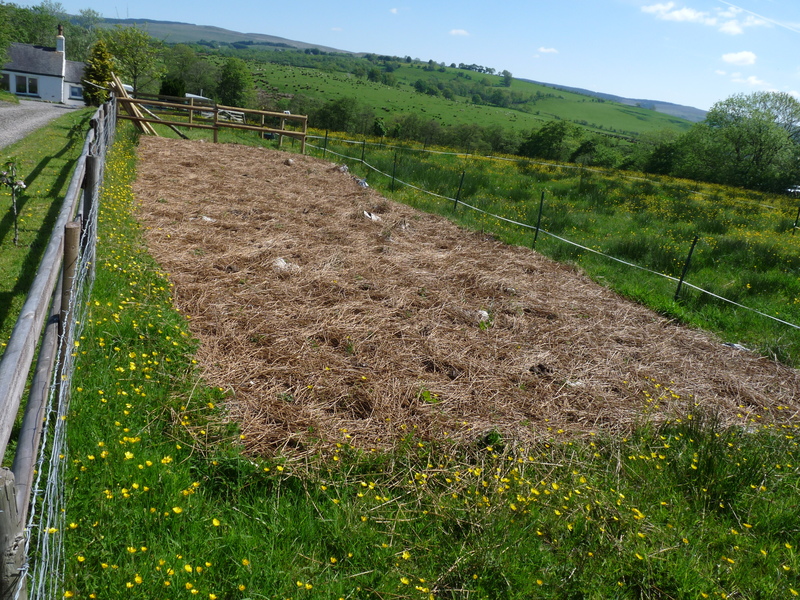 The grain-bed a year on – May 2014. 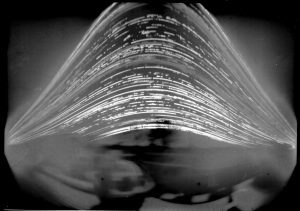 So, despite successfully implementing the lessons from our first attempt, another grinding failure, but with more lessons learnt. ‘Get Wisdom’, said Solomon. No one said this was going to be easy. Being a blessing to the land, while trying to live from it, is hard work. And yet we believe the very ground is redeemed through the Incarnation and Resurrection of Christ. It just needs working out in fear and trembling. Hi Rob. That made for interesting reading. I suppose you was unlucky with the weather to an extent. What are your thoughts for growing grain in 2014? Hello Mike. Good to hear from you. Sorry you can’t make the Open Day. Remember loading all that farm manure onto the trailer?! This year we’re using the work done by our pigs in turning over the ground. But, again, growth of broadcast seed does not look promising at the moment. Not sure why. Maybe because the ground was so wet when the seed went in, it rotted? Don’t know. We may still have some joy. I’ve just ordered some organic barley, following Cuthbert’s late example, to spread on a drier area prepared by the pigs. We’ll have to see how it goes.